There are two debug flags which can be set and saved in any game's password with the help of a custom password generator, since the game cannot set these flags by itself. The RAM address of these flags is $0107. Set Bit 3 (or use password 3★11 91 3191 11) to enable the invulnerability. Set Bit 5 (or use password D★31 11 3191 11) to enable the level select. During the game, press Left/Right on Controller 2 to change the stage, but only between stages 1-1 and 4-2. Placeholder graphics of one of the unused banks. It says "Bank for PAL", so presumably it was for the European version of the game. 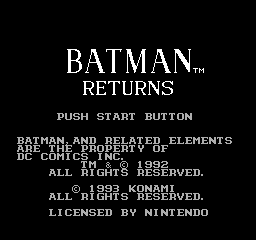 As with most games made by Konami after 1990, this game contains some simple copy protection. During the game, there are two particular places where the protection checks are performed. The first one performed at the second part of Stage 2-2, once when a helicopter bomber enemy appears on the screen and checks for the Konami logo tilemap in the PRG-ROM. The second one occurs on Stage 2-3 during the battle on Ivory Tower, where it constantly checks for the presence of a part of the title name tilemap. If one of these tests fails, the special protection flag is raised. There are two main effects triggered. First, at Stage 3-1, it will change the state of the stage so that if you had already recorded the Penguin's conversation, but the flag for this event isn't raised, making the level unable to be completed (no exit appears). Second, any passwords obtained after the protection is triggered will fail at the password entry screen, this effect is permanent unless you reset the console or enter any valid password.